I am fascinated with the relentless human drive for MORE. More money, power, oil, stuff, attention, real estate, "love", touch, achievement, impact, freedom, etc. Like some mythical state, "More" becomes a heaven that when reached, I know I will finally feel full, satiated, and complete. I used to call it "reaching my potential" and it usually involved a list of badass accomplishments, saving the world, and a soul mate. My own version of a blissy, floaty, virgin-filled paradise. Ironically, the feeling state I am seeking is always available just underneath this drive and if I can slow down and get present, I get to experience it. It is subtle and requires shifting all of my awareness from this drive to this moment. From this place, this entire game of more is revealed. It is innocent and powerful and based on a fundamental misunderstanding. Just underneath the drive for MORE is ENOUGH. From this place we can aim this drive in infinite, creative directions. We can point this firehose of evolutionary impulse toward a new way of being and doing on this planet. When I understand I have enough, I AM enough, my soul tends to drive, my ego wiggles into the passenger seat, and this road movie gets a lot more interesting and fun. Manari Kaji Ushigua Santi is one of the 500 remaining Sápara Tribe in the Ecuadorian Amazon. Rebecca F. Rogers and I just spent a few weeks deep in the jungle, walking through ancient primary rainforest, sitting in ceremonies, and learning from him and his people. "The first step in healing your addiction to more", he told me, "is to stop judging it." Manari doesn’t just drop wise words, he embodies it. Here I am, a white woman from the North, whose way of life is relentlessly encroaching not only on his way of life but the Amazon Rainforest upon which life on our entire planet depends, and his purpose is to heal me. Me! He offered cleansing rituals with sacred tobacco and shared his love for the mysteries and medicine of the jungle with remarkable generosity. “No worries,” he seemed to say, “just hang in this jungle for awhile, connect to these plants, and you will remember who you are.” He was right. “With the support of Pachamama Alliance, we have prevented oil extraction in our territory for the past 20 years. Unfortunately, our government recently sold new concessions to the Peruvian national oil company. The consequences are potentially fatal not only for us, but for our entire world. The Sápara believe that the destruction of our land would not only affect all humans but also the non-material, spiritual world: plants; animals; trees; and water—as we are all from Earth. We must transform the behavior responsible for continuing to drive the destruction of the Amazon rainforest and the crises we face together as a human society. My father, grandfather, and great-grandfather were powerful Shimanul—Shaman in the Sápara language—and decided that I would continue the lineage soon after my birth. I began special training to connect with the spirits of the forest and our ancestors. While my father is no longer living, he still teaches me in my dreams. From the Sápara perspective, many of the challenges that humanity is suffering from are due to people not remembering where they come from and being disconnected from the dreams they have each night. Connecting through our dreams and with the natural world is a way for people to unblock and tap into insights they are unable to see now. Pachamama Alliance is working to awaken people so that they can both see the possibility for and to create collective change around the world. This partnership is critical for both keeping oil development from our lands and for creating a future that works for all. Now more than ever, we have to all come together to defend the rainforest. And we must come together to inspire the transformation that the world needs at this critical time. I thank you from deep within my heart for your ongoing support, solidarity, and partnership. Together, we have been effective for many years in protecting the world’s most culturally and biologically diverse rainforest. Now we must finish the job we have started together and achieve permanent protection for the heart of the world and the lungs of our planet. 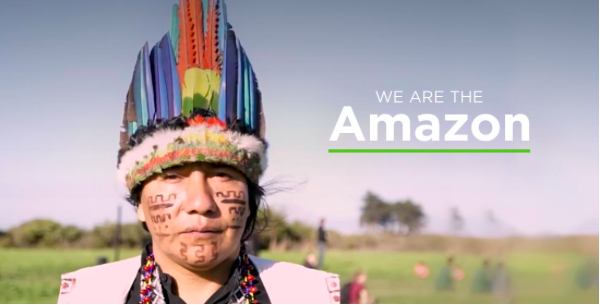 Donate to Pachamama Alliance today for the continued protection of our rainforest lands. Why not use this Christmas to discover the intergenerational patterns innocently passed down from your parents that you want to end with you? The science lab of the holiday dinner table is rich with opportunity to witness those pesky old “traditions” that keep everyone playing their expected roles of victim, perpetrator, martyr, drunk comedian, co-dependent, avoidant, racist, activist, doormat, workaholic, etc. I mean that can be fun too, your choice. The shift from saving the world to serving it, is a shift from head to heart, of ego to soul. Serving the world, I’m discovering, has nothing to do with who I think I am or should be, but instead about what the world needs and what is being asked of me. What makes you come alive? What moments feel like you are in resonance with your soul? When you are in resonance with something or someone you will likely feel like your whole body is a tuning fork being dinged against something and every cell stands at attention. Heartbreak, be it environmental, political, professional, financial, romantic, or familial, is one of the most intense, spiritual experiences a human can have. If you found this blog you may be suffering from acute heartbreak of a soulmate love gone awry. I get it. It hurts like hell. Treat it with reverence. You are currently in the process of updating your inner operating system. Think of this pain like the growing pains of your tween years that attacked your shins, but instead these are the growing pains of the mind. The ‘you’ you have been until this moment has served you well and now there is a new you emerging. Some call it spiritual growth, initiation, or transformation. Call it whatever you want. Right now you are being asked to harness this life moment for your greatest healing, learning, and expansion. Pain is not your enemy. Pain is the spaceship you are boarding to explore the wide expanse of your inner universe—why you choose who you choose in love, and what love actually is. If your heart is being broken, let it break wide open. Pain, when truly surrendered to, will guide you home. You don’t have to believe me now. Just wait. Here are a few steps that worked for me. Everything you think you know is about to be ripped to shreds. Congratulations! It is the best thing that will ever happen to you. Welcome to life. Consider yourself a young Karate Kid and Life your new Sensei.